And, really, it's pretty good stuff. It shows where they were coming from, and is surprisingly good for a demo. It is a little "sparser" than their later work, which is to be expected i guess. 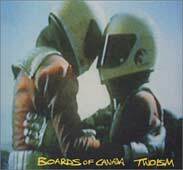 But, for the most part, the "Boards of Canada sound" was more or less fully formed at inception. Most of what they were to do on their later work was hinted at here. Several of the songs are noteworthy, but let me first discuss the a-typical songs. Basefree is a more drum-driven track then Boards of Canada usually do. In a way, it reminds of the drummy dub of Pub and is very nice. The only other tune that really sticks out to me is Smokes Quantity, which is a long, wandering, ambient piece. More ambient and mellow that Boards of Canada usually do in fact. It's decent enough, but i think i would have preferred some of their fine drum loops behind the keys. However, those are the only 2 songs on this release that seem out of place in the general BoC catalog. The other tracks fit right in alongside Geogaddi and Music Has the Right to Children, and do it quite nicely. The whole album is kicked off with Sixtynider, which is electronica in a minor key: mournful and slow and beautiful. Directine features standard BoC keyboard drone with drums, only here the drums sound almost organic and really make the song work. Likewise, Seeya Later take the keys and layers them with some nice deep bass riffage for wonderful headbopping. Iced Cody again follows the formula, only here the keys themselves are distorted. They waver and whine in an odd way that, i swear, sounds like the instrument was wet and in the process of shorting out, or like it was played underwater. Very interesting, and perhaps life-threatening! In general, this is a Boards of Canada album, and if you like their music this is a fine purchase. If you haven't liked them yet, then this isn't going to win you over. Geogaddi, their most recent album.